Our Valentine's Giveaway has one paperback of 52 Weekend Challenges: Cultivating Health & Happiness to giveaway to someone looking to improve their health little by little. 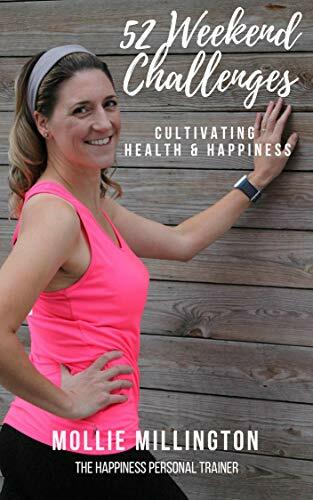 Mollie Millington, aka the Happiness Personal Trainer, has packed some of her most powerful and accessible holistic health and happiness ideas into this new book. "52 Weekend Challenges: Cultivating Health & Happiness" encourages readers to try something new each week to enjoy a sense of achievement, surprise and enjoyment. The ‘challenges’ aren’t too challenging. Ranging from trying a new food or recipe to attempting a minute of press-ups or attending a new fitness class, they also include ideas as diverse as de-cluttering a room to inviting friends around to play a board game and testing your own blood pressure to setting SMART goals. 52 Weekend Challenges gives you a little push to try something new and, in some instances, leave your comfort zone for a short while to discover new experiences and connect to the world more mindfully with a healthy, ‘can do’ approach. Each challenge is accessible and achievable – giving an immediate sense of achievement (itself a powerful motivator!). Over time, you will develop self-confidence in your abilities through these short challenges, inspiring you to take positive action towards health and happiness the rest of the week. Mollie is a firm believer you should do what you love: if it’s not enjoyable, why do it? The idea of 52 Weekend Challenges: Cultivating Health & Happiness is to nudge you to try something new, enjoy a little lift as you complete the challenge and introduce some healthy lifestyle hacks into your day-to-day. There are, in fact, 60 challenges in the book – to allow people to skip any that don’t suit them for any reason – and Mollie encourages people to record their experience each week. She also has the hashtag #Challenge52 to connect readers on social media as they take their journey over the course of a year. In addition, Mollie has included five 15-minute “Quickie Workouts” at the end of the book to help people step up their physical activity to complement the other challenges. This book giveaway is now closed. Join our mailing list to find out about more book giveaways.